Insects > Ladybugs > What Do Ladybugs Eat? Because They Save Gardens By Eating Pest Insects. So what do ladybugs eat? Most ladybugs are predators. They eat other insects, most of which are considered pests to humans who like to grow plants for food or beauty. They are often called a ‘gardener’s best friend’. 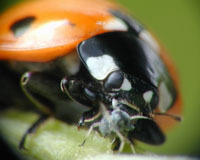 The most common insects that ladybugs eat are aphids, which are serious pest of plants. That’s why ladybugs can be the gardener's best friend. They will control the pest insects in the garden without the gardener having to use chemical pesticides. 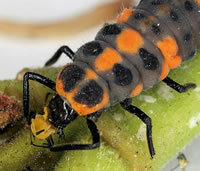 Even larval ladybugs eat aphids. They also eat other insects that have soft bodies, like mites, white flies, and scale insects – all of which are pests of plants. However, the question of what do ladybugs eat is much more complex than this. There are exceptions to most every rule, for example sub family Epilachninae can actually be considered vegetarian ladybugs. Some of them eat fungus, like mushrooms. There are some that like to dine on mildew. Still others prefer eating leaves and can even become pests of some plants. Still, most ladybugs are not pests. In fact, due to what they eat, most of them can almost be thought of as exterminators. After all, the majority of ladybugs subscribe to a diet that allows them to eat other pests. Hence as a group they are considered predators. 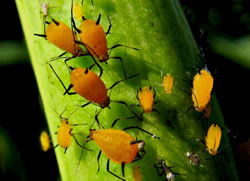 At the very least, the fact that they can effectively keep a garden – and all the plants in it – free of aphids is certainly beneficial. It’s great that what a ladybug eats helps humans with the food that humans eat.